KILLED: A photo montage of Kyron Bartholomew, aka Beetlejuice, who was shot dead on Wednesday. IN THE first three days of this year, five people have been murdered, with the last three being killed within a three-hour period on Wednesday night. The latest murder victim, up to press time, was Kelvin Rennie who died at the Eric Williams Medical Sciences Complex in Mt Hope after he was shot in the head in Malabar. At about 10.30 pm on Wednesday, police responded to a report of shooting and found Rennie bleeding at Ackbarali Extension. Rennie, who was identified by relatives yesterday, was found wearing a white jersey and pair of black jeans. 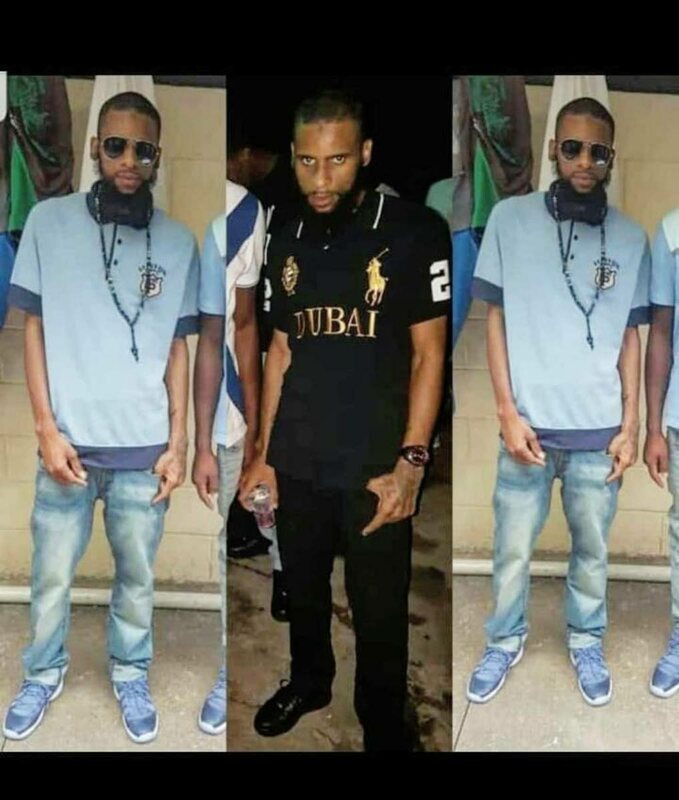 An hour earlier, two teenagers stabbed 22-year-old Keenan Primus who was liming at a friend’s home on Bushe Street in Curepe. The suspects, aged 16 and 17, are now in custody. One of the suspects, the 16-year-old boy, went to his home took up a knife and with the help of his 17-year-old friend, stabbed Smith several times. Then at 7.30 pm, Kyron Bartholomew was shot dead. Bartholomew, also known as “Beetlejuice” was driving a grey Nissan AD Wagon along Calvary Hill in Arima. When he got near to a bar on Calvary Hill, a gunman walked up and fired several shots. Bartholomew who was shot several times, tried to driver off but his car veered into a nearby wall. Relatives at the Forensic Science Centre in St James were reluctant to speak to the media, saying Bartholomew was a private person and he “wouldn’t want the fame”. Asked about allegations that his murder may have been linked to a shooting incident last year, relatives dismissed this claim. “We don’t care what anyone says, we know who he is,” said a relative who did not wish to be named. Although the country has already recorded five murders, Commissioner of Police Griffith yesterday said the rate has dropped drastically when compared to last year’s statistics. Griffith said since his appointment as commissioner, the rate has dropped significantly. Statistics coming from the Crime and Problem Analysis Branch (CAPA) supports Griffith’s stance. According to CAPA, between January 1 and 2 in 2018, there were seven murders in Central Division and one murder each in the Western, North Eastern and Northern Divisions. By the end of January 2018, 60 murders were committed. Acting ACP Macdonald Jacob yesterday commented on the three murders in Northern Division, saying the police are making every effort to reduce the murder rate in the division this year. "We have an idea who are the assailants and what is taking place and we will make every effort to put a stem to it." Jacob said. Three of the five murders which occurred for the year so far happened in the Northern Division. Last year in that Division, 118 people were killed. The other two murder victims this year are Samuel Sookdeo who was shot dead in Couva on Tuesday and Daniel Mahabir - TT's first murder victim for 2019, who was beaten to death with a rock and his body found on New Year's Day at Concession Drive, Sea Lots. Reply to "5 DEAD IN 3 DAYS"